The 2015 Ford Edge Sport has been officially SAE-certified as the most powerful Edge ever, with the highest horsepower and torque ratings yet. Powered by Ford’s newest EcoBoost® engine – a 2.7-liter V6 – the 2015 Ford Edge Sport builds on its reputation as the modern utility vehicle for people who want to have fun behind the wheel and look good doing it. Edge Sport’s 2.7-liter EcoBoost V6 engine delivers a small increase in horsepower over the previous standard engine, a 3.7-liter V6, and a 25 percent increase in torque – for a total of 315 horsepower and 350 lb.-ft.
With final ratings approved, the front-wheel-drive Edge Sport returns EPA-estimated test cycle fuel economy ratings of 18 mpg city, 27 mpg highway and 21 mpg combined. EPA-estimated ratings for the all-wheel-drive model are 17 mpg city, 24 mpg highway and 20 mpg combined. Actual mileage will vary. Even with improved performance, fuel economy estimates are either equal to or better than the 2014 model Edge Sport. Using the same compacted graphite iron as Ford’s 6.7-liter Power Stroke®, the cylinder block of the 2.7-liter EcoBoost has a stiff and compact design that results in an impressive amount of power and torque for its size, while enabling refined noise, vibration and harshness control. A die-cast aluminum engine-block ladder frame and composite oil pan help save weight through the use of advanced materials where they are needed most. The Edge Sport suspension has been upgraded with front and rear antiroll bars that are 15 percent stiffer than the base model. Unique rear monotube dampers are larger in diameter, while coil springs are 10 percent stiffer and offer 20 percent less body roll than the previous-generation setup. Enhanced damping gives Edge Sport improved road-holding capability – providing the driver with more control, sharper steering and greater confidence. Edge Sport rides on 20-inch standard polished aluminum wheels with magnetic low-gloss painted pockets; 21-inch premium painted tarnished dark low-gloss aluminum wheels are available, as well as a summer-only tire option with the 21-inch wheels. The vehicle is equipped with Active Noise Cancellation technology to manage and enhance the sound of the 2.7-liter EcoBoost engine. The system uses microphones strategically placed throughout the cabin to generate opposing sound waves. These waves are directed through the audio system to enhance overall cabin ambience. The 2015 Edge Sport includes features that set it apart on the road and define it as a performance-inspired utility vehicle with attitude. The new Edge has a stronger, more athletic shape with standard LED taillamps and LED signature lighting. 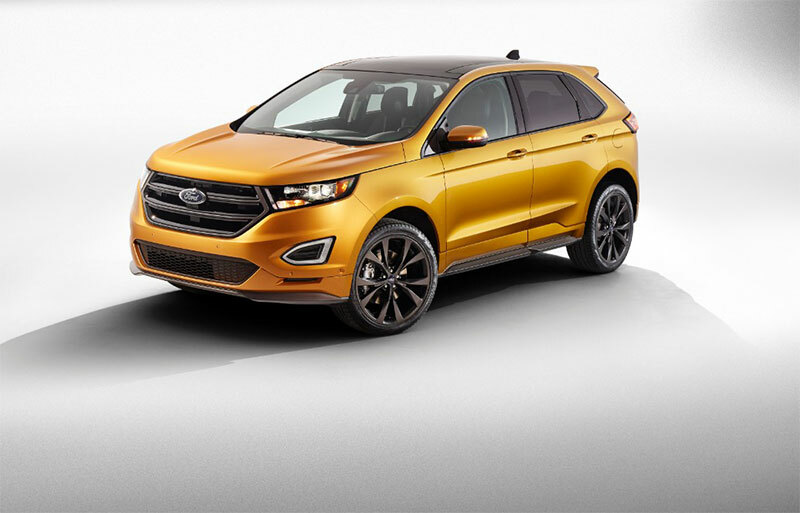 The 2015 Edge is also available in new colors Electric Spice, Bronze Fire Metallic and Magnetic. The interior features leather-trimmed sport seats with perforated suede inserts, aluminum brake and accelerator pedal covers, ambient lighting and metal-plated accents throughout. Other interior appointments include Ford SYNC® with 8-inch LCD touch screen in the center stack, two configurable LCD screens in the instrument cluster and a media hub containing two USB ports, an SD card reader and an auxiliary input jack. A 12-speaker Sony audio system is standard. When it goes on sale this spring, the all-new Ford Edge will be available in a new range-topping Titanium series, as well as the base SE model and SEL series. Base model pricing starts at $28,100, excluding destination and delivery charges. Pricing information is available at www.ford.com. Along with the 2.7-liter EcoBoost, two other engine options are available on the 2015 Ford Edge. The standard twin-scroll 2.0-liter EcoBoost four-cylinder is rated at 245 horsepower at 5,500 rpm and 275 lb.-ft. of torque at 3,000 rpm (on 93-octane fuel), and returns EPA-estimated fuel economy ratings of 20 mpg city, 30 mpg highway and 24 mpg combined with front-wheel drive and 20 mpg city, 28 mpg highway and 23 mpg combined with all-wheel drive. An optional 3.5-liter Ti-VCT V6 is rated at 280 horsepower at 6,500 rpm and 250 lb.-ft. at 4,000 rpm, returning EPA-estimated fuel economy ratings of 18 mpg city, 26 mpg highway and 21 mpg combined with front-wheel drive and 17 mpg city, 25 mpg highway and 20 mpg combined with all-wheel drive.